It is absolutely beyond me why the people of this region, or even worse St Lucia and Dominica, are not making a big deal about the fact that the St Lucia’s cabinet adopted a Kwéyòl version of their National Anthem. Ok, maybe everyone is not into Culture as I am but shouldn’t we at least celebrate this attempt to safeguard one of our nation-state’s cultural identity? We blab and blab about how we must show greater appreciation for where we come from often with folks of the older generation feeling as though our younger generation is disconnected from their past and gravitates heavily towards pop culture. I am not in a position to validate or dispute those claims. I am just here to say, this is incredible! While I don’t believe that the patois spoken in the Helen of the West Indies will just disappear as it is so much a part of who they are as a people, future generations will also be able to identify with the language, not only for the sake of knowing their colonial past, but an expression of self. In other words, this is a huge accomplishment for culture in St Lucia; the perfect example of sustained efforts towards cultural preservation. My ancestors must be smiling from wherever they are. The decision to adopt the new Chanson Nasyonnal (Kwéyòl for National Anthem) came on the eve of Sent Lisi’s 37th Independence celebrated on Feb 22 2016. This momentous and historic act was also done in commemoration of UNESCO’s International Language Day celebrated each year on February 21. This didn’t happen over night! Since 2010, work on adopting the Chanson Nasyonnal had commenced.Although there were earlier attempts at a Kwéyòl version by a church group in Gros Islet, the Kwéyòl Language Committee of the Folk Research Centre (FRC), chaired at the time by Lecturer, Ms. Lindy-Ann Alexander, decided to develop and seek formal adoption of a Kwéyòl version of the National Anthem that captured the essence and meaning of the original song written in English by Fr. Charles Jesse, OBE (deceased). The 43-year-old FRC that had been encouraging the promotion of the Creole culture in all its aspects, commissioned Pastor Wulstan Charles to prepare a first draft for consideration. His submission formed the working draft for adoption. The final version of the Chanson Nasyonnal was developed after going through a number of iterations. This work was undertaken by a special committee chaired by Her Excellency the Governor General, Dame Pearlette Louisy. The government of St Lucia has been long promoting the use of the Kwéyòl. This is evident in the compilation, publication and distribution of a Kwéyòl Dictionary commissioned by the Ministry of Education. I am definitely looking forward to seeing similar arrangements being made in Dominica! Quilt Peforming Arts Company’s Excerpts from ‘Colour Me’ catapulted me into immense feelings of discomfort, sadness, hope, joy…and I can’t possibly list all! ‘Colour Me’, written and directed by Rayon Mclean with contributions from his colleagues, Maya Wilkinson and Odain Murray was staged on Saturday February 27 2016 at the Phillip Sherlock Centre, in Kingston Jamaica. Quilt PAC delivered an explosive culturally infused production nudging the corridor of power with unceasingly intense socio-cultural and political commentary using “colour” as a metaphor for a varying number of issues. Predominantly speech, the theatrical presentation also featuring dance and song explored and challenged topics such as socialization, living up to the expectations of society, internal conflict towards self-actualization, remaining true to who you are as an individual and a people, political ideologies and misconceptions of political participation. There may be more, but these are the most memorable for me. But it is so much more than the script. It was the impeccable delivery. I’d say ‘Colour Me’ is a myriad of metaphoric excellence except sometimes, there were no filters for some perceptions. It is a work of a creative genius, brimming with provocative imagery and symbolism through poetry, drama, movement, music, sound and lighting. The multitalented Quiltans were extremely committed to their roles from beginning to the end. They performed each piece with so much conviction that it would be hard not to experience the passion and power emanating from their presence every time they graced the stage. Noteworthy are the singers. Their melodious sound of blackness echoed in the theatre causing the audience to “ooooh”, “ahhhh” and “mmmm”. While there were some commendable solo pieces, they were all better together as they created a beautiful harmony. My favourites are “Fly Away” to the colour green scene which was a symbol for healing and growth as well as “True Colours”. “Pink is for Girls, Blue is For Boys” is a phenomenal piece that effectively addresses how our society dictates who we should be rather than encouraging us to express who we are or desire to be. The Quiltans that led both sides were so immersed in their roles contributing to an incredible delivery. This is definitely one of my favourites. Kudos to Mclean for incorporating Maypole and the Jamaican indigenous folk forms such as Kumina and Dinki-Mini into his work. That Afro-Caribbean song and movement was brilliantly choreographed and directed. Compelling arguments were presented about society acting like “zombies”. Not thinking in times of desperation and even when making decisions about who should govern us. The piece on “marking the x” is so profound as it addresses the relationship of the poor with politicians who come bearing gifts. The relationship is characterized my desperation and vulnerability. Despite the hardships faced by these individuals, they still support those who show up for them in their times of need; an experience most of us could never understand. Subsequently, there was a call for a “Revolution” which was indeed artistically revolutionary. The movement were so precise. The second half really increased my level of discomfort but anyone who knows me is sure that this is a good thing! Here is where I add; the lighting was the icing on the cake! It definitely helped to enhance what was already an amazing theatrical showcase. Although young, Quilt Performing Arts Company is a powerhouse with enormous electric potential. I am inclined to believe that this group has recognized the power they have to encourage change as artists within the creative arts and also in our society. Their performance this weekend was quite a refreshing experience as they provocatively and creatively captured so much of who we all are and what we are confronted with daily. A splendid depiction of what art means to many of its practitioners, an expression of our true selves. Quilt Performing Arts Company is a growing dynasty. I am impressed! Watch out fi dem! I would like to pay the most utmost respect to the family, friends, and the spirit of Asami Nagakiya. I would like to send my sincere thanks to all the people that make T&T Carnival a great experience for all residents and visitors alike. I would like to say that I in no way mean to offend anyone by my opinion documented in this piece; however, I wanted to share it in order to empower and salute the people of this awesome country. With all of that being said, let me state this as clearly and as frankly as possible; “I don’t care about Mayor Tim Kee and anything good or bad that may or may not come out of his mouth. You may be remarking that it is awfully easy for me to say since I am a Canadian and he is not my mayor; however, I am saying it nonetheless. I will add that spending any of your precious time, energy, or consideration on him or his sentiments would be a total waste. Again, others may criticize me for being insensitive and I assure you that is not the case. I do not think that you should spend your time worrying about Mayor Tim Kee because his sentiments alone have proven that he is only your leader by ceremony and not by truth or conviction. In other words, you as a people are on another level so to speak. I also think that you should not pay him any mind because the more attention you pay to him the more power you give him. Asami’s murder and Mayor Tim Kee’s awful headlines made global headlines and trust me, the world knows that the good people of Trinidad in no way agreed with his sentiments. The truth of the matter is that the power to change the way women are treated in this country lies with the people. You are all great citizens of a great nation. Anyone can see that Trinidad has a strong culture, fantastic energy, but most of all, a warm and courageous heart. The outpouring of love, sympathy, and sadness for this young person was truly touching. The action that the citizens took to show how sorry they were that this took place in their country was moving. The words of one man doesn’t wipe that love away. The words of one man are just the words of one man. Silly people say silly things, but you can put silly people in their place and keep them there until they change their ways. The sad thing about this story is that for Mayor Tim Kee to say those words shows that he simply does not know any better. If a charitable person that is close to him wants to help him to learn about violence against women, he would be better for it; however, this will not change the current state of affairs for women in Trinidad. Man or woman, child or adult, the best thing you can do to improve the welfare of women in Trinidad is take some quiet time to reflect on your own views, perspectives, and actions. When women that you do not know pass by do you make comments that would make your grandparents ashamed? Do you know of a neighbour or family member that is in an abusive relationship but you turn a blind eye because it isn’t your business? Do you force your children to hug and kiss strangers even when they say it makes them feel uncomfortable? Do you tell your children they are stupid or allow others in positions of authority to do the same? When you hear “no” do you listen? When violence occurs in a different racial/class category from your own do you disregard it? Do you look at sexual pictures or videos of young people that may have been taken without their consent? Are you outraged by the number of Trinidadian people that simply go missing and most likely are being trafficked into sexual slavery? Are you taking part of the grooming process that occurs in sexual and physical abuse? Are you allowing yourself to be groomed for abuse because you are afraid of being alone? Do your children witness you being emotionally, verbally or physically abused my a loved one or family member? What is going on mentally that is creating the present environment around you? If you don’t like what you see around you what are you doing to change it? I know that what I am saying may come off “preachy” but it comes from a place of understanding and some regret. You see, I am from a city called Winnipeg, Manitoba, in Canada. Unfortunately, our reputation isn’t great. We are known for having the highest murder rate in Canada, as being the most racist city in the country, and for the horrible treatment of our Indigenous Women. We are only beginning to learn that no elected official can fix this issue for us and their often ignorant remarks are just s symptom of the infection that we have allowed to fester for so long. I am not proud to say that I have looked the other way when my fellow citizens were being mistreated because of my own prejudiced attitudes. Last year they found the remains of a 15-year-old girl named Tina Fontaine in the Red River and in my heart I knew that the consciousness of the city was beginning to change. We could no longer remain silent and we had to stand up in our own communities and show that enough was enough. Most importantly, we had to look in the mirror and come to terms with our own nasty opinions; whether we admitted to others or not. I am proud of the huge number of Trinidadians that rose up out of apathy to condemn what Mayor Tim Kee said; you should be proud, too. Conversations of the travesty of his senseless words were buzzing in all nooks and crannies of the country. Nevertheless, it is time to let him learn whatever lesson he needs to learn on his own. Focus on the most important person of all, yourself. Whether you know it or not, at least one person is looking up to you as a role model and you will lead by example. What is your legacy going to be? What are you doing today to make next years’ carnival a safe one for everyone? Better yet, what are you doing today to make your personal environment a safe one. I said it before and I will say it again, I am not concerned about Mayor Tim Kee and anything that he says; however, I have been truly touched by the people of Trinidad and Tobago. My condolences again go out of the family and friends of Asami Nagakiya; may her spirit be remembered and may she rest in peace. Keisha Paul is a business consultant and facilitator that focuses on teaching small business skills to budding entrepreneurs from a variety of backgrounds. Her work has brought her to England, St Kitts, and to work with stakeholders from all corners of the world. She is involved in both the private sector as well as in the nonprofit and development communities. Currently, she is focussing on growing her client base and investing in her business. 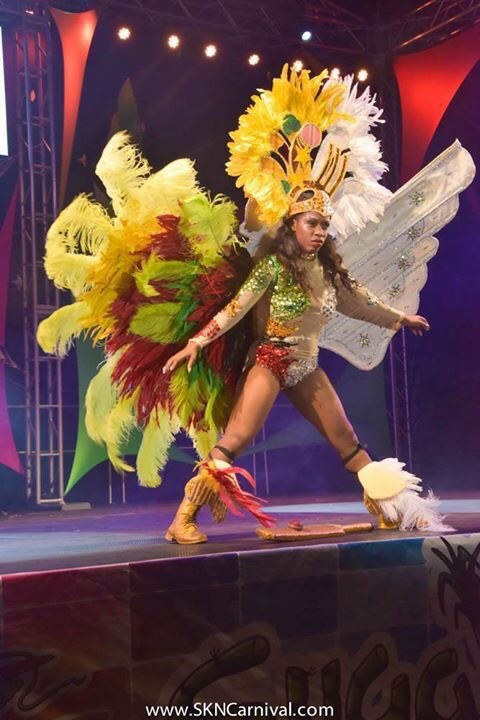 The piece that Jaheida Lewis paraded on stage for the segment, National Pride, highlighted the newly founded CPL T20 team, St. Kitts & Nevis Patriots. It was drawn by, 20 year old Sasha Herbert, resident and avid artist in SKN. I was recently asked to do choreography for an Opening Number for Rex Nettleford Hall (UWI, Mona) Uber Fashion show dubbed ‘Retro Caribbean’. The song that was selected was Faluma by Alison Hinds. 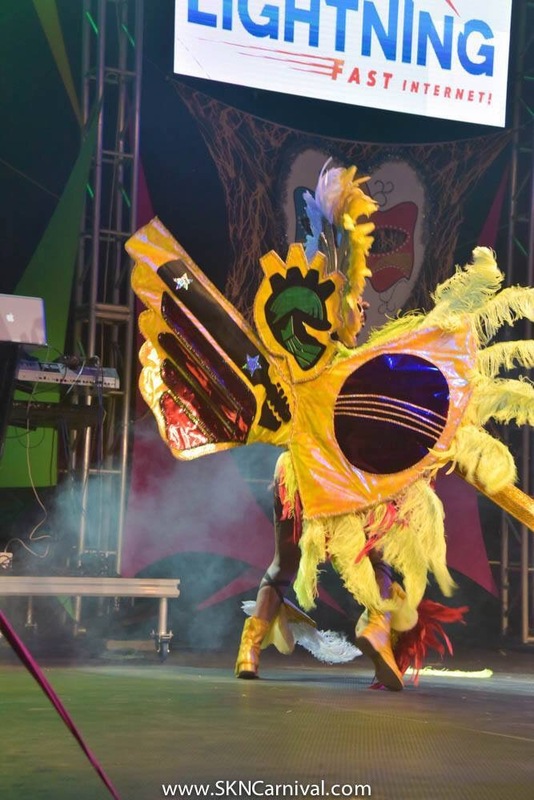 I had an immediate Soca rush! I felt that one all through my veins and I thought “WOW! Some Soca songs just never get old”. So, I thought, why not share my favourite old school Soca songs and help to jump start your weekend? Add them to your playlist. I promise you’ll thank me later. This list can go on and on! Don’t see your favourite? Tell me what’s your favourite old school Soca songs! Love Soca? Share with your friends!